As a native Texan gal, snow will forever be magical and always leave me enchanted. This past weekend we were hit with a blizzard here in NYC, making me want to do nothing but drink hot coffees and hang out with friends in various apartments in my neighborhood. On the night of the blizzard we walked a few blocks away to a cozy gathering of friends in town for NYFW. In the middle of the night we walked back to our place in a surreal New York City scene. The streets were covered in blankets of powdery glitter, vacant of cars... just people wandering around in its beauty. Of course the next morning the city had already cleaned it up in the streets ( as pictured above), but for a minute there, NYC was a true winter wonderland. Anyway, hope you all had a lovely weekend and great start to your week! Beautiful sweater and skirt! You look fantastic! Too beautiful... also it was the same here in Boston! aww you look so cute in that outfit! :) by the way, I love your shoes, wish I could see them better! I totally understand your love for snow... we don't get snow pretty often here so I always admire a winter wonderland! I don't think there's ever a day you don't look absolutely perfect. You are a goddess! You look amazing! Perfectly accessorized. I love the colour palette of this outfit. Lovely skirt! The pictures are brilliant! This outfit is super adorable, Bonnie! so pretty! i love the colors. everything about this is adorable! Snowy NYC is so lovely! Love your beautiful Lauren Moffatt top! Colorado keeps on getting small dustings of snow but no big beautiful piles and I am feeling a bit disappointed! You look gorgeous as always, glad it sounds like you are loving your new area! super cute outfit! love the hat! 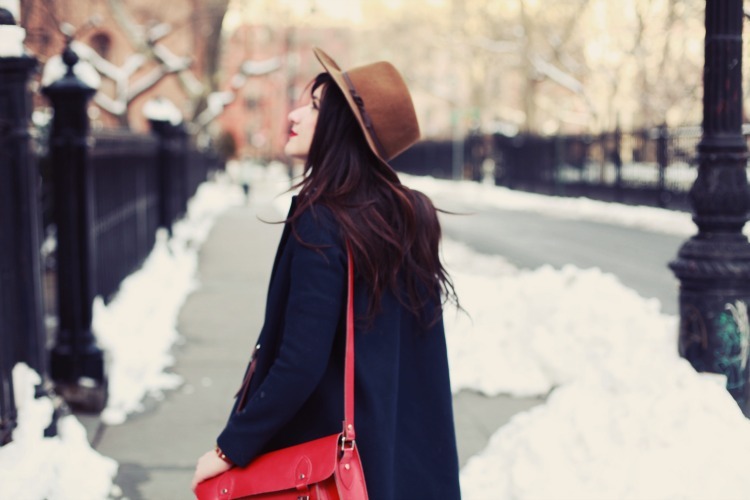 this is the cutest outfit and it's making me want a red satchel even more than i already do! ps. enter my new giveaway to win the UD naked basics palette, real techniques brushes and essie polishes! click here. how lovely! i love this outfit! I love your positive attitude. Your blog posts always cheer me up and your outfits are always adorable. The blue jacket goes together beautifully with your romwe skirt. There was much more snow by me but it's raining. There will probably be more to shovel tomorrow but I can enjoy the fashionista posts tonight. I love snow, it makes places looks so magical! I'd love to see NYC covered in snow - one day! You look lovely, I adore your skirt and hat. Such a cute, comfy, and simple look! The skirt and striped top look as if they are made for each other. Such a great pairing. Super look, Bonnie. Stay warm. Lovely, your photos are wonderful! I just restarted my blog i hope you can check it out! your photos are always so warm and dreamy! i love the processing on them!! Love that gorgeous red bag. Stunning! What a gorgeous outfit! You can certainly rock a hat! I love the moment when the snow just has fallen and everything is covered under a white blanket....it's all so peaceful then. I also adore your style, a visit to your blog is always a great inspiration. Good recommendation. In this share,the writer has given his/her best to promote the trade of the product. Now a days, we all are surrounded with countless firms who are having the capacity to provide the needed amount of blankets to the client as due to their regular inspection of stock, they never face the query of stock shortage.